In an exclusive series of articles to The BRICS Post, South African minister of international relations and cooperation Maite Nkoana-Mashabane explains her country’s role in the multi-lateral grouping that has come to be known as the world’s economic dynamo. “BRICS is a platform for dialogue and cooperation among countries that represent 43 per cent of the world’s population, for the promotion of peace, security and development in a multipolar, interdependent and increasingly complex, globalising world. “Coming, as we do, from Asia, Africa, Europe and Latin America, the transcontinental dimension of our interaction adds to its value and significance”. Since coming into being as a formal entity in June 2009, the BRICS bloc has introduced a new dynamic in global geopolitics. BRICS is a continuation of the tradition that was firmly established 57 years ago, in April 1955, when countries of Asia and Africa met at the historic Bandung Conference to galvanise their collective muscle in the context of the Cold War and assert themselves in the international system. The Bandung Conference, which led to the formation of the Non-Aligned Movement (NAM), was a historic watershed in the international relations of developing countries. Amid pressure from a growing Cold War bipolarity, those countries were able to affirm that they would choose neither the East nor the West, but pursue their own path and strategy under the guidance of the “Bandung Principles” of Afro-Asian solidarity. South Africa was at the Bandung Conference, represented through the African National Congress, whose centenary we celebrate this year. The present context of international relations and cooperation between Asian, African and Latin American countries – collectively known as countries of the South – remains critical, and has become more important than ever before. When South Africa joined BRICS in 2010, it was once again an affirmation of what this country has achieved in creating a better Africa in a better world. They affirmed that “BRICS aims at contributing significantly to the development of humanity and establishing a more equitable and fair world”. BRICS has since its inception had a positive effect on the international system; as it has challenged traditional economic powerhouses; China has recently been ranked as the second-biggest economy in the world, overtaking many others. These same countries have been providing leadership in the current global economic crisis, as many countries look up to BRICS members for a way out of the current financial system. The world we live in today has changed significantly since the end of the Cold War, thanks to this new group of economically influential countries, which are on the ascendancy, re-mapping the contours of political and economic power in the global system. We are at the brink of a world envisaged in South Africa’s Freedom Charter; we are far more aware today of the importance of global interdependence than any time in history, and it is evident that forging fruitful partnerships and a stronger global governance template requires cooperation between the developed and developing countries. At a BRICS forum earlier this year in New Delhi, leading academics poignantly reflected that while there had been a proliferation of global multilateral conferences, there had also been a proliferation of a different kind of forum that is plurilateral in nature. They commented that “these forums should not be perceived as fragmenting the multilateral system; [they] could create valuable opportunities to form consensus among smaller, like-minded groups on specific issues, which can again cascade into the broader multilateral forums”. Indeed, the view of the BRICS is that, as articulated in one of its summit communiques, “the global economy remains vulnerable, with a negative impact on the everyday lives of people all over the world, affecting jobs, trade, development and the environment”. In asserting itself in the world as part of the agenda to transform power relations in the global system, the BRICS leaders recently jointly pledged additional funding of $75 billion to the International Monetary Fund (IMF), for the so-called “firewall fund”. China will provide $43 billion, Brazil, India and Russia $10 billion each and South Africa $2 billion, and this pledge is in line with our vision to transform institutions of global governance. It has been a tradition, and indeed a norm, that decisions in international financial institutions are made and influenced by countries with strong financial muscles. In this regard, the more we contribute financial resources to such institutions, the better the chance and prospects for us as a country to influence decisions. The BRICS pledges were contingent on the completion of the quota review to, among other things, better reflect the relative weights of IMF members in the world economy, which have changed substantially in view of strong GDP growth in dynamic emerging markets and developing countries. Another separate, but strategically important, agreement was the announcement to put in place a swap arrangement, allowing central banks to lend to each other if needed to maintain market liquidity and a mechanism for pooling foreign exchange reserves. From the account of the outcomes of the Group of 20 (G20) Summit on February 16, 2012, it is clear that BRICS economies have become the new engines of global growth. South Africa and the other BRICS countries share a common vision: We are striving to enhance inclusive economic growth that will lead to an increase in the creation of decent and sustainable jobs, advance the fight against poverty and accelerate the economic transformation of our countries. We also dream and work to realise a more equitable global political and economic system. South Africa will host the 5th BRICS Summit in Durban on the 26-27 March, 2013. I have been following with interest a vibrant public discourse on South Africa’s membership of BRICS, linked specifically to Goldman Sachs and the writings of its Asset Management Global Chairman, Jim O’Neill. In his recent article entitled South Africa’s BRICS Score: Not All Doom and Gloom, he concluded: “South Africa could more than justify its presence (in BRICS) if it helped Africa to fulfil its remarkable potential”. I can assure Mr O’Neill that the objective to fulfil Africa’s remarkable potential is at the forefront of our political and economic diplomacy. 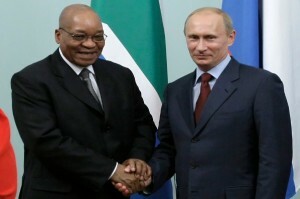 South Africa will host the fifth BRICS Summit in late March 2013, which will also complete the first cycle of BRICS summits. The opportunities presented in hosting this prestigious summit are considerable. South Africa’s membership of BRICS is premised on our global, regional, continental role as well as our domestic achievements in the “proudly South African manner”. To partner with key players of the South on issues related to global governance and its reform. Our membership of this body has indeed expanded BRICS’ geographic and intercontinental reach, including its global representation and inclusiveness. South Africa has always been at the forefront of promoting more inclusive formations and more equitable participation of notably emerging markets and developing economies in the world system and its decision-making structures. This belief stems from our core conviction that Africa has to be repositioned in the global system to assume its rightful place. South Africa, together with other African countries, initiated the dialogue with the Group of 8 (G8) in 2000, which led to the subsequent endorsement of the AU’s New Partnership for Africa’s Development (NEPAD) by the international community at large. At the last BRICS summit, President Jacob Zuma once again strongly articulated this view, also in light of the issue of the World Bank Presidency, where Africa had put forward an exceptionally merit-based candidate. South Africa’s invitation to join BRICS takes cognisance of our country’s contribution to shaping the socio-economic regeneration of Africa, as well as our active involvement in peace, security and reconstruction efforts on the continent. Our membership in BRICS also recognises South Africa’s own unique historic political transformation process to become a constitutional democracy. This constitutional model linked to our reconciliation and nation-building processes and peaceful political transition, is perceived as a unique contribution to the world. We have indeed facilitated similar processes for peace elsewhere in the world. South Africa is a systemically important economy, which is diversified and includes a sophisticated services sector and well-developed infrastructure comparable with developed countries. In terms of strategic considerations for business, South Africa provides direct access to the rest of the continent and is situated between the East, the Americas, Europe and the Middle East. South Africa has many geostrategic and related structural advantages which make it an excellent investment destination and ideal “gateway” partner in the African growth story. Complementary to this existing and strong consumer market, are the exciting regional integration initiatives taking place in the continent. Negotiations are underway to establish a 26-country, $1 trillion African Tripartite Free Trade Area (T-FTA) for East, Southern and Central Africa within three years, which will expand this market to 600 million people. This regional integration initiative will put us in the same market size-bracket as our BRICS counterparts. South Africa hosted its first information and communications technology (ICT) Indaba travel trade show recently, where we had a discussion on our interaction with BRICS. During that discussion, we indicated that in 2010, BRICS accounted for 13 per cent of global demand in the ICT sector, with spending of about €328 billion. As South Africa is one of the leading investors among developing countries on the continent, South African companies can take advantage of this unique position, through partnering with BRICS companies to explore commercial opportunities in Africa. For example, the Brazilian company Vale has partnered with South Africa’s Rainbow Minerals in an agreement worth more than $1.2 billion to build a copper mine in Zambia. Tata Power has formed an equal joint venture with South Africa’s Exxaro Resources, named Cennergi (Pty) Ltd, to develop and operate power-generation projects in South Africa initially and will have later projects in Botswana and Namibia. I wish to focus our business leaders on the fact that South Africa’s service sector comprises two thirds of our economy (65.9 per cent) which compares favourably with our BRICS partners and provides niche opportunities. The BRICS Business Forum further cited opportunities in sectors such as, but not limited to, agriculture, energy, infrastructure, mining beneficiation and healthcare. It is clear that South Africa already enjoys comparative advantages in these cited sectors. Domestic economic priorities, such as increased beneficiation at source, could be pursued through joint partnerships and ventures. The BRICS countries now constitute the largest trading partners of Africa and the largest new (not total) investors. 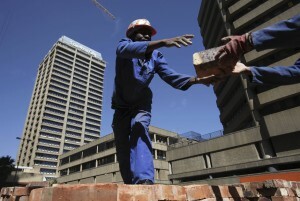 The BRICS investment portfolio in Africa is very encouraging and promising. Next week, minister Maite Nkoana-Mashabane will discuss the need for a development bank to fund BRICS projects. Ms Maite Nkoana-Mashabane is minister of international relations and cooperation of the Republic of South Africa. She was an active member of the United Democratic Front (UDF) and served in the various structures of the Mass Democratic Movement (MDM) and the ANC underground structures. She has also been the Chairperson of the ANC Women's League.